Sometimes it can get a little overwhelming when you sit back and think about how many Disney characters have become such important parts of our lives. I think that maybe only Marvel Comics can give Disney a run for its money when it comes to how many characters it owns. And with all that great material, Disney is always looking for unique ideas to help bring them to the public. Olszewski is one of those rare artists who has been able to take these characters and scenes that we have seen so many times and present them to us in a way that you would have never thought possible. His two newest pieces, Kidnap the Santa Claws from Nightmare Before X-Mas and Mad Tea Party from Alice In Wonderland, will blow you away. The thing that will strike you most about both figures is that they are tiny. I mean, the Mad Tea Party set is only 2-1/4 inches tall. But despite their diminutive size, they have more detail than a lot of collectibles that are three or four times their size. I have always been a huge fan of Nightmare Before X-Mas. Everything from the music to the story to the character designs that Tim Burton adapted and sometimes borrowed from the drawings of the late, great Edward Gorey make it one of my absolute favorite movies. There have been tons of statues and figures made for the license already, but this piece really shines out near the top of the heap. What really brings this piece to life for me is the amazing job Olszewski did on the sculpting. Every single character in it looks crisp and amazingly detailed despite the fact that it is only 2-¾ inches tall. I also like that he didn’t just do a couple maquette style figures, he took the time and care to beautifully re-create a great scene from the movie. 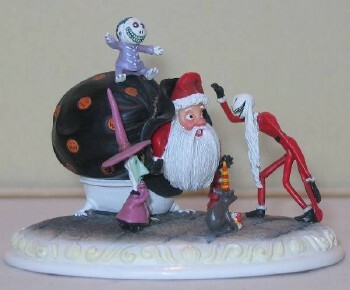 In the piece, you not only get Jack Skellington, but you also get Lock, Shock, Barrel and Santa. It’s just one of the nicest pieces I’ve seen for Nightmare is quite some time. Even though I liked Nightmare more than I liked Alice In Wonderland, this piece is my favorite between the two. I’m not sure how Olszewski is able to work in this scale. I almost think he has a couple 4-inch gnomes doing most of his handy work for him. The colors on the Mad Tea party are vibrant and surreal, just like in the movie. The detailing on every character is so sharp that when you look at the photo gallery, you will not believe how small the piece is until you see it next to the Cookie Monster PEZ. It really is quite a treat. Every tea pot and chair look just perfect. Probably the most impressive part was how they were able to capture the detailing on the Door Mouse, when the figure that represents him here can’t be more than ½-inch tall. Article on Toy Shop Magazine Online can be found here.